Facilitating a range of focal lengths, zooms are often bulkier and heavier alternatives to primes, however, and rarely offer very “fast” apertures across the entire zoom range. Among the lenses we’ve tested on the D5, there is one f/2 zoom, as well as a host of options for fixed f/2.8 apertures, which professional photographers require when working in low-light environments. With the D5’s incredible low-light performance — notably the dynamic range and ISO improvements using mid to high ISO (1600–12,800) sensitivities — it’s plausible that the extra stop of light at f/2.8 becomes less relevant. 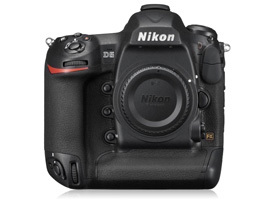 So does the Nikon D5’s sensor ISO performance mean that pros will start opting for cheaper and lighter-weight f/4 alternatives? Time will tell. We’ve tested a total of 47 zoom lenses on the Nikon D5, with scores ranging from a high of 33 points on the Sigma 24-35mm f/2 A wide angle zoom, to a low of 17 points on the Tamron 28-300mm f/3.5-6.3 XR Di super-zoom. Our review looks in detail at some of the best-performing zooms across five categories, including ultra-wide-angle, wide-angle, 24-70mm standard, 70-200mm telephoto, and long telephoto zoom. We’ll also discuss the best value option in each category, so whether you’re looking for the highest-quality optic for regular pro use, or a cheaper alternative for the odd occasional job, you’ve got all the info you need. An ultra wide-angle zoom facilitates focal lengths as wide as 12 or 14mm on a full-frame sensor, and is a useful optic for architecture and landscape work. Shooting in environments where space can be restricted, its ultra-wide field-of-view ensures that you can fit everything in, and rectilinear ultra-wide lenses keep lines reasonably straight, so images don’t suffer the exaggerated barrel distortion of a fisheye lens. Ultra-wide lenses also exaggerate the space between subjects in the foreground and background, which makes for great landscape photography compositions. The effect can be used creatively in other categories, too, such as portraiture or product photography, producing some unusual and dramatic effects. With only a limited number of options available in this category, we tested three ultra-wide lenses on the Nikon D5, including the $1897 Nikon 14-24mm f/2.8G, the $949 Sigma 12-24mm f/4.5-5.6 EX II, and the discontinued Sigma 12-24mm f/4.5-5.6 EX. With an overall score of 28 points, the own-brand Nikon 14-24mm f/2.8G is miles ahead of the Sigma competition (both with 18 points), winning in all lens metric categories, and featuring a fixed f/2.8 maximum aperture… but at twice the price. The Nikon 14-24mm f/2.8G delivers excellent sharpness in the center of the frame — around 70% acutance at all focal lengths using apertures up to f/11. 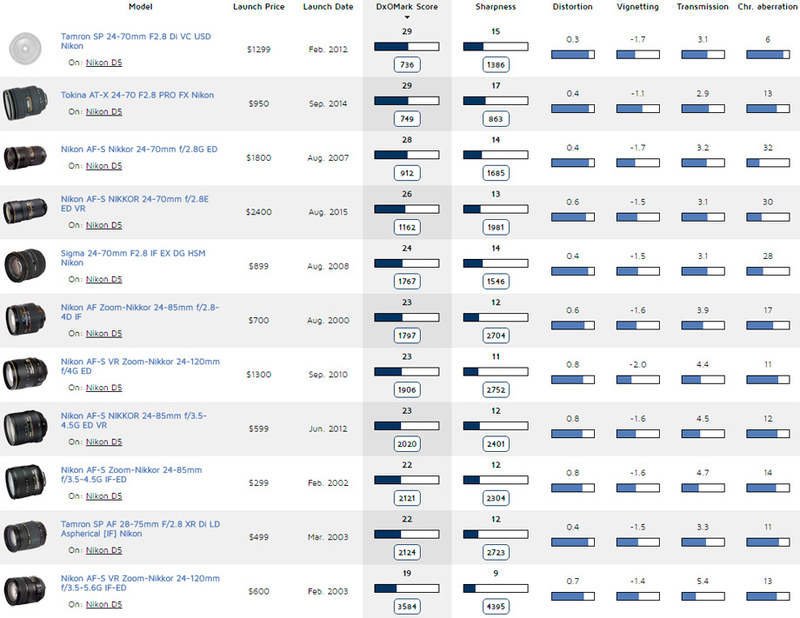 Resolution is very respectable at the edges, too — around 65% acutance at many settings, and 60% at 24mm. Overall resolution at f/22 drops to around 55% acutance, but it’s still relatively uniform on the Nikon, making it a high-quality option for long depth-of-field, ultra-wide-angle architecture or landscape shots. Center resolution is a little lower on the Sigma — around 65% acutance at most settings, and it’s a bit more inconsistent in the outer field compared to the Nikon, with greater edge softness at some settings such as 24mm f/5.6. The Nikon 14-24mm f/2.8G handles chromatic aberrations a little more consistently, too, particularly at the widest focal lengths, at which the Sigma fringes heavily in the outer field at its widest 12mm focal length. (Fringing is much improved between 18 to 24mm on the Sigma lens, however.) 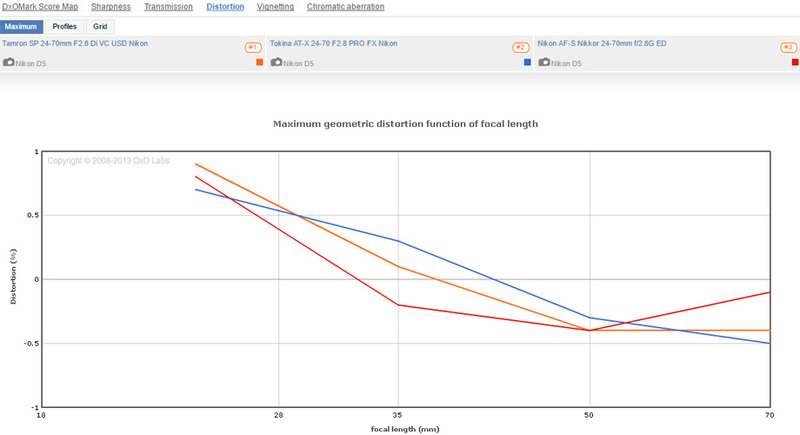 The distortion profile of the Nikon and Sigma lenses is similar, with noticeable barrelling at the widest 12 and 14mm focal lengths (as you’d expect), and with straighter lines between 18 to 24mm despite some minor barrelling at 18mm and pincushion at 24mm. 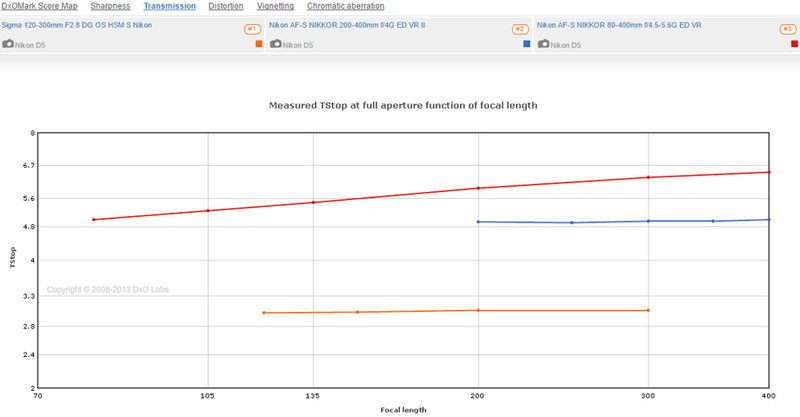 Both lenses display fairly heavy vignetting at their widest aperture and focal length settings, which isn’t a surprise. Closing down a couple of stops reduces vignetting considerably on the Nikon, but corner shading of over –1Ev persists on the Sigma at 12mm f/5.6. The more traditional 17-35mm focal length is favored by many press and event photographers, as it provides a useful wide field of view, as well as a longer 35mm focal length for portraits or shots for which you can get a bit further back. We’ve tested 11 wide-angle zooms (including the ultra-wides previously covered) on the Nikon D5, and scores range from a high of 33 points on the Sigma 24-35mm f/2 A, to a low of 18 points on the Sigma 12-24mm f/4.5-56 EX. The three top-performing options in this category are the $899 Sigma 24-35mm f/2 A with 33 points, the $1199 Tamron SP 15-30mm f/2.8 VC with 29 points, and the $747 Nikon 18-35mm f/3.5-4.5G with 28 points. The Sigma 24-35mm obviously provides a shorter focal range and isn’t as wide as either the Nikon or Tamron options. It boasts a faster fixed f/2 aperture, however, which as mentioned, is pretty rare on a zoom and useful for shooting in low light. The Sigma Art range of lenses also offer exceptional sharpness, and the 24-35mm is almost has good as having separate 24mm and 35mm prime lenses in your kit bag. The Tamron and Nikon offer the more classic wide-angle zoom focal length, with the Tamron slightly wider at 17mm. The Tamron boasts a fixed f/2.8 maximum aperture and this, together with its image stabilization system, makes it a better low-light option than the Nikon. All three offer excellent sharpness in the center of the frame at all focal lengths up to f/11, with the Sigma fractionally ahead. Strong edge sharpness is difficult for a zoom to achieve at all settings, but these three wide-angles cope very well at most settings, with no particularly troublesome corner softness at any focal length. The Sigma is just a little more consistent, however — hence its higher sharpness score, with good edge sharpness even at f/2. Some heavy corner shading wide-open at the widest focal lengths occurs with all three lenses, and it’s marginally worse on the Sigma at –2Ev due to its wider maximum aperture. Significantly less vignetting occurs between f/4 to f/16 on the Sigma, though, and it’s marginally better than both the Tamron and Nikon at these settings. The Sigma and Nikon options handle chromatic aberration extremely well at all settings, with the Tamron displaying some edge fringing between 15 to 20mm at the wider aperture settings, but nothing too concerning. The Sigma offers the least distortion, with only minor barrelling at 24mm and minor pincushion at 35mm. 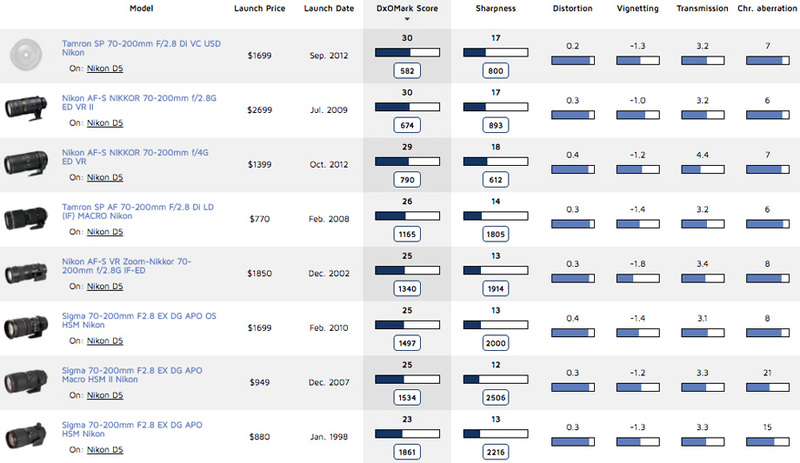 The Tamron and Nikon both barrel more heavily over 1% at their respective widest focal lengths. The Tamron is much improved between 18 and 30mm, but the Nikon continues to barrel over 0.5% at all focal lengths except 28-35mm. Of course, if you’re shooting RAW, all of these flaws can be easily corrected using software lens profiles, but for photojournalists shooting straight to JPEG, the bigger consideration may be how well the Nikon D5 addresses these lens issues in-camera. 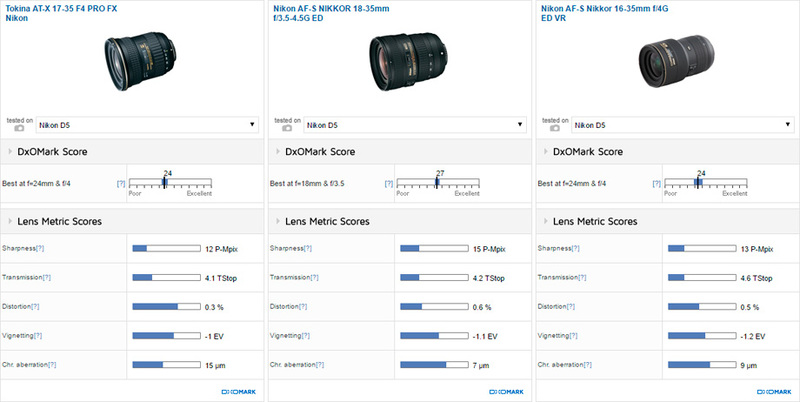 At $747, the Nikon 18-35mm is a good value option on the D5, with solid scores on par with the more expensive Tamron in most categories. At $449, the Tokina 17-35mm f/4G is both cheaper than the Nikon 18-35mm and less than half the cost of the $1097 Nikon 16-35mm f/4G (another popular wide-angle zoom for weddings, photojournalism and events). The Tokina 17-35mm f/4 boasts similar metrics to the Nikon 16-35mm, with marginally better transmission, distortion, and vignetting, albeit with slightly lower scores for sharpness and chromatic aberration. The Nikon 16-35mm is slightly sharper in the center of the frame and a little more consistent in the outer field, too, which is particularly true at the wider focal lengths. Heavier fringing is evident on the Tokina at wider focal lengths up to 28mm as well, but considering the cheaper pric,e these may be flaws you’ll be happy to live with. A popular work-horse lens for many pros, a standard zoom offers a focal range from wide-angle through to short-telephoto. This makes it super-convenient for shooting wide-angle views, for doubling as a good portrait option, or for simply all-round shooting of a range of subjects. Often featuring fast fixed f/2.8 maximum apertures, they’re useful in low light, too, and great for throwing a background out of focus (bokeh). We’ve tested eleven 24-70mm standard zoom lenses on the Nikon D5, with scores ranging from a high of 29 points on the Tamron SP 24-70mm f/2.8 Di VC and Tokina 24-70mm f/2.8 Pro, to a low of 19 points on the longer, variable aperture Nikon 24-120mm f/3.5-5.6. 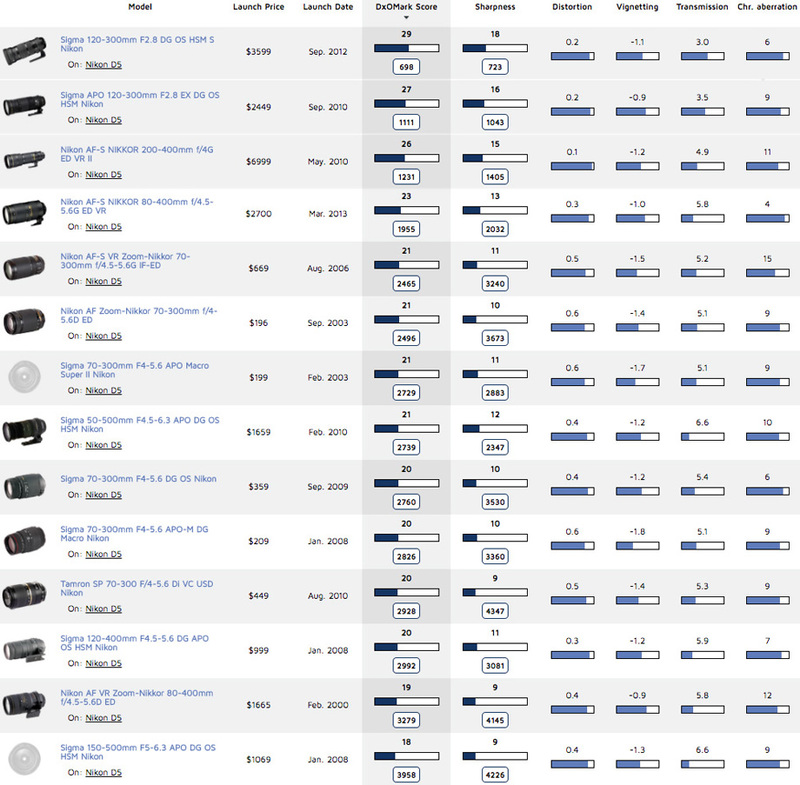 The podium positions go to the $1299 Tamron SP 24-70mm f/2.8 Di VC and $1097 Tokina 24-70mm f/2.8 Pro with 29 points each, and to Nikon’s own $1797 24-70mm f/2.8G, just behind with 28 points. 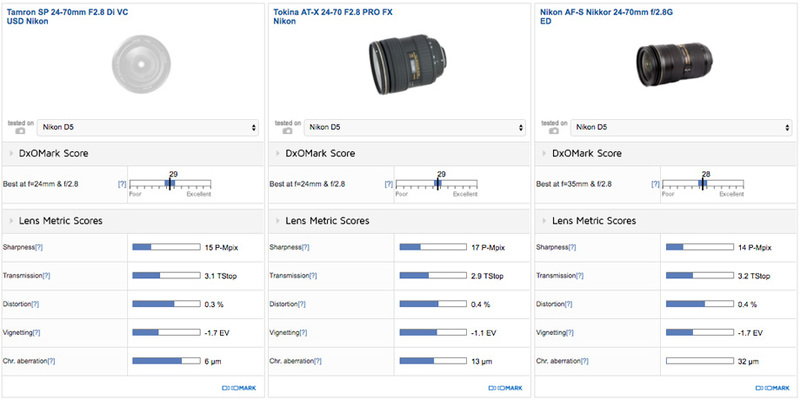 All three post very similar overall scores, and they’re all excellent standard zooms, but the Tokina just edges it for overall sharpness at 17 P-MPix. The Tamron is the only one in the top three to feature image stabilization, which might be a consideration depending on what you’re shooting, but it’s debatable how useful stabilization is on a lens of this type. If it’s a feature you’re after, the new and updated $2397 Nikon 24-70mm f/2.8E VR standard zoom features both a new electromagnetic aperture diaphragm (denoted by the E in the lens name), as well as Nikon’s 4-stop image stabilizer. It’s a bigger, heavier and more expensive option, however, and the older G version is still available if you can live without the extra features. 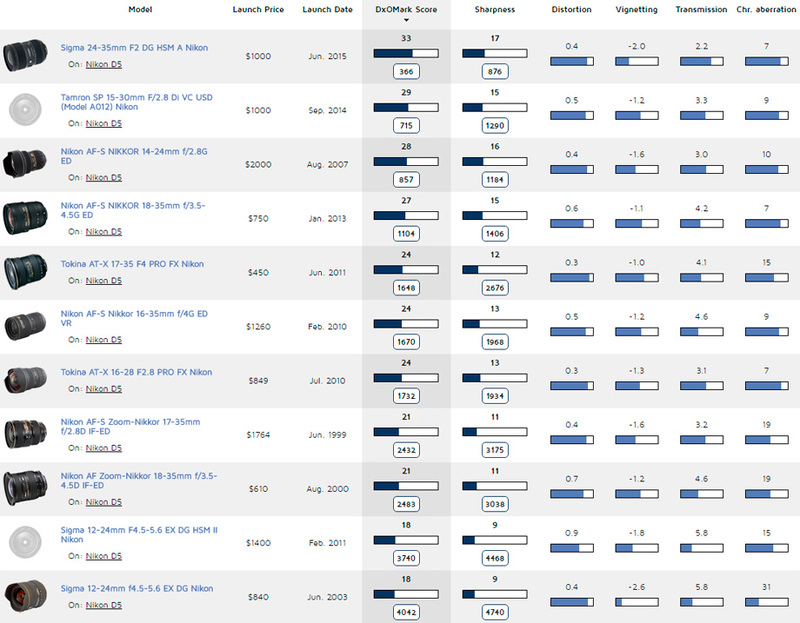 This lens ranks just above the new E version in our lens metrics scores, too, although to be fair, the results are pretty close. All top three lenses offer excellent center sharpness of over 70% acutance at all focal lengths, using apertures up to f/11, and are respectable at f/22, too. The Tokina is a little more consistent in the corners, displaying strong edge resolution of over 70% acutance between f/4 to f/11, where it hits peak sharpness. The Tokina is slightly worse than the Tamron and Nikon at f/2.8, however, with the Nikon performing fractionally better at f/2.8 in the corners, which is important to know if you’re planning on regularly shooting wide-open. Distortion profiles are similar across the three lenses, with all displaying some noticeable barrelling at 24mm, and then much improved between 28 and 70mm. The Tokina displays the least corner shading of the three overall, with slightly improved results at f/2.8 and f/4, although the Nikon 24-70mm f2.8G is very good for vignetting between f/5.6 to f/22 at all focal lengths. 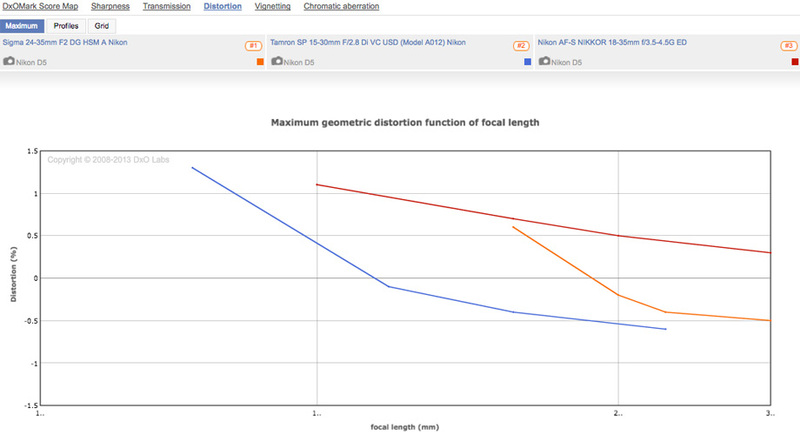 Poor chromatic aberration on Nikon 24-70mm f/2.8 standard zooms has been a known issue for a while, and as we can see from the global map, Tokina, and particularly Tamron, have managed to significantly reduce fringing. Although the Nikon map looks terrible, it’s worth pointing out that heavy fringing occurs mainly on RAW files, which can obviously be corrected in post-production, and in-camera processing significantly reduces fringing on Nikon JPEG files. You can pick up a Sigma 24-70m f/2.8 IF EX discounted at B&H for $649, for example, which is half the cost of the Tamron and a third the cost of the Nikon equivalent. The Sigma boasts similar overall scores to the Nikon, although it isn’t as sharp in the corners at f/2.8, which could be an important consideration for some, but it’s comparable in the center. Transmission and distortion are about the same, although the Sigma displays more corner shading at 24mm compared to the Nikon. Chromatic aberration on Sigma RAW files doesn’t fare much better than for the Nikon either, and will require some correction in post-production. “Fast” telephoto zoom lenses keep a large maximum aperture fixed through the focal range, making them bigger, heavier, and more expensive options for pros or serious enthusiasts using the D5. For many of these photographers, however, a fast telephoto zoom is one of the most important lenses in their kit bag. The fast aperture enables them to shoot a range of distant subjects (sports, wildlife, etc.) in all lighting conditions, as well as successful take portraits and headshots with nice background bokeh. Image stabilization is a useful feature on a telephoto lens of this type, enabling shake-free shots at 200mm using slower shutter speeds around 1/60 sec, which can be very handy shooting at full zoom in low-light environments. In order to keep the size, weight, and price down, fast telephoto zooms don’t commonly offer focal lengths longer than 200mm, with a typical range of 70-200mm for full-frame shooting. We’ve tested eight 70-200mm telephoto zooms on the Nikon D5, with scores ranging from a high of 30 points on the Tamron SP 70-200mm f/2.8 Di VC to a low of 23 points on the Sigma 70-200mm f/2.8 EX DG APO. The highest-ranked 70-200mm telephoto zooms on the D5 include the $1499 Tamron SP 70-200mm f/2.8 Di VC and the $2097 Nikon 70-200mm f/2.8G VR II with 30 points each, and the slower-aperture $1397 70-200mm f/4G VR just behind with 29 points. 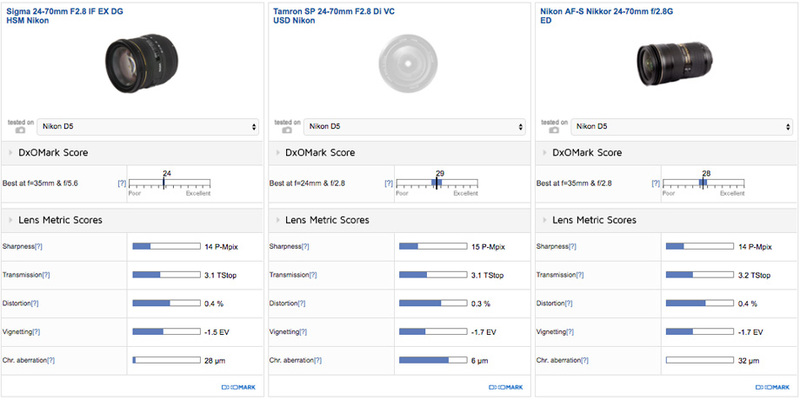 The Nikon and Tamron f/2.8 versions post almost identical scores on the D5, with high levels of sharpness in the center of the frame at all focal lengths and apertures up to f/11. The Nikon own-brand f/2.8G is slightly sharper at f/16 and f/22 compared to the Tamron, but the Tamron is a little better in the outer field when shooting wide-open at f/2.8. This is particularly true at the wider focal lengths up to 135mm, and the Tamron is slightly sharper in the center of the frame at 200mm f/2.8, too, which is an important setting on a lens of this type. Distortion profiles between the Nikon and Tamron are basically the same, with some minor barrelling on both lenses at 70mm, and roughly the same amount of pincushion at 200mm. 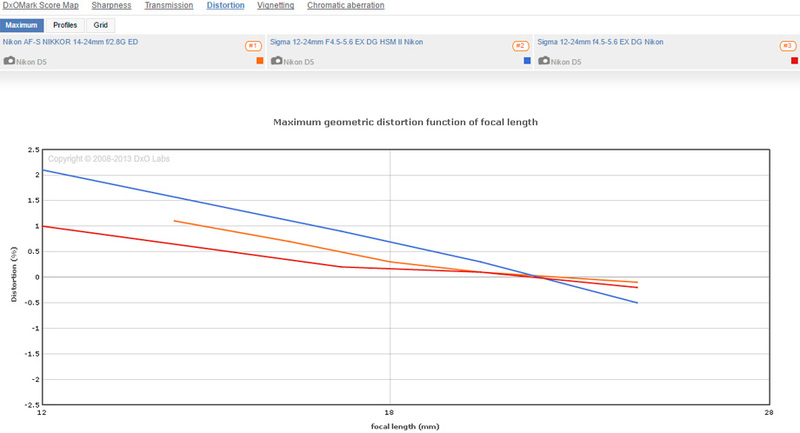 With all distortions between a 0.5 to –0.5% tolerance on both lenses, it’s not really an issue, however. Light transmission of 3.1 TStop ensures that both lenses are nice and bright telephotos to use in low light, and there’s no problematic chromatic aberration to worry about either. The Tamron displays heavier corner shading at f/2.8 compared to Nikon, resulting in its lower headline vignetting score of –1.3Ev, but to be fair, there’s not much in it. As mentioned in the introduction, if pros can sacrifice a wider f/2.8 maximum aperture thanks to the improved mid-ISO range performance of the D5, the $1397 Nikon 70-200mm f/4 represents a big savings in both price and weight. The f/4 is currently around $700 cheaper than the f/2.8G version, but with a newly-announced Nikon 70-200mm f/2.8E ED VR model with a massive $3299 price tag, the f/4 is nearly $2000 cheaper — cash you can put towards the D5! The replacement Nikon 70-200mm f/2.8E VR includes the new SPORT VR mode, reduced minimum focus distance, and the promise of improved AF tracking and exposure control, so there are new features, but still, it’s expensive. Putting all that into perspective, Tamron’s 70-200mm f/2.8 Di VC represents good value at $1499, with comparable overall image quality to the Nikon f/2.8G. If it’s an own-brand Nikkor you’re after, though, and you can’t break the bank with an f/2.8 model, the Nikon 70-200mm f/4 VR also posts some great scores. A long telephoto lens is defined as having a focal length reach of 300mm at the long end of the zoom. Zoom lenses of this type aren’t very common, as they’re difficult to manufacture, as well as being too big and heavy for many photographers, but they can be extremely useful for certain sports and wildlife pros. There’s no particular standard for long telephoto zooms, with a variety of different focal lengths and maximum aperture settings available. Sigma offers a couple of somewhat unique options, such as the monster 120-300mm f/2.8 and x10 zoom 50-500mm f/4.5-6.3, and there are more mass market-oriented, variable-aperture 70-300mm super-zooms as well. Although such super-zooms are arguably too low-grade for use on the flagship D5, the $497 Nikon 70-300mm f/4.5-5.6G VR achieves some respectable scores with good center sharpness up to 200mm and f/11. It’s weaker at the edges, with lower resolution around 55% acutance at 300mm, but it’s a reasonable value option on the D5. The Sigma 50-500mm f4.5-6.3 and Nikon 80-400mm f/4.5-5.6 variable-aperture lenses offer even greater focal length reach, and while they’re not super cheap, these lenses are more affordable than the specialist options. Costing over $6000, the Nikon 200-400mm f/4 long telephoto zoom really is the preserve of the professionals who need both the flexibility of a super-telephoto zoom and an f/4 aperture for good performance in low light. We’ve tested fourteen long telephoto zooms on the Nikon D5, with scores ranging from a high of 29 points on the Sigma 120-300mm f/2.8 DG OS HSM to a low of 18 points on the Sigma 150-500mm f/5-6.3. The three top-performing long telephoto zooms on the Nikon D5 include the $3399 Sigma 120-300mm f/2.8 DG OS HSM with 29 points, the $6997 Nikon 200-400mm f/4G ED VR II with 26 points, and the $2297 Nikon 80-400mm f/4.5-5.6G ED VR with 23 points. The Sigma is an unusual 120-300mm focal length with a fixed f/2.8 aperture, making it a versatile alternative to the 300mm prime lens that pros commonly use for press, sport, and wildlife shots. The Sigma 120-300mm features image stabilization for effective use in low light, but at nearly 3kg in weight, it’s a pretty big and heavy lens to carry around regularly. In comparison, the Nikon 80-400mm is roughly half the weight, as it uses a slower variable maximum aperture that lets through roughly 2 stops’ less light at 300mm compared to the Sigma. The Nikon 200-400mm f/4 is also over 3kg in weight, so both it and the Sigma really demand a monopod for prolonged use at sporting events or when patiently waiting for wildlife to appear. The Sigma 120-300mm boasts the highest overall score for sharpness, with excellent resolution in the center of the frame at all settings. Although the two Nikon lenses offer excellent center resolution up to f/11, they’re not as quite strong as the Sigma at the smaller aperture settings. The Nikons are slightly sharper at the edges at their respective maximum apertures, however, but this isn’t surprising, given that the Sigma opens up to f/2.8. The Sigma is still very respectable at f/2.8, but it hits peak sharpness between 120 and 200mm at apertures between f/5.6 to f/11. Both Nikons offer good uniform resolution again using apertures up to f/11, with the Nikon 200-400mm displaying excellent uniform sharpness at 400mm f/4; and although edges are softer between f/16 to f/32, these are less crucial settings on a lens of this type. The Sigma obviously has the superior light transmission, thanks to its larger maximum aperture, which provides more light for the autofocus system. That, combined with image stabilzation for slower shutter speeds, makes it a good low-light option. Some noticeable chromatic aberration occurs in the outer field on the Nikon 200-400mm f/4 using apertures between 200 to 300mm, and fringing is handled slightly more consistently on both the Sigma 120-300mm and the Nikon 80-400mm. A lower overall vignetting score for the Nikon 200-400mm f/4 is a result of slightly more corner shading at the maximum aperture, compared to 80-400mm at f/5.6, but close down the Nikon 200-400mm to f/5.6 and it’s better than 80-400mm at this setting. The Sigma vignettes around –1EV using f/2.8 at all focal lengths, as well as a little bit between 200 and 300mm up to f/8, but it’s not overly concerning.